Vanholio: Wear Your Blaze Orange Safety Vest – Hunter's Aprowlin'! Wear Your Blaze Orange Safety Vest – Hunter's Aprowlin'! In lots a the country, it's deer and elk season, among others. That means hunters in the national forests and BLM land where vandwellers boondock. Wear blaze orange when you walk around. That's Vanholio's advice. See, most hunters is smart'n skilled. They don't hunt near the roads and marked trails where they ain't supposed ta. And they'll make sure you're game and not some van life camper before shootin'. But it ain't the good or average hunters ya gotta worry about. It's the drunk dumbasses. Wearing a blaze orange safety vest or whatever helps. Plus stickin' to marked roads and trails. But ain't no guarantees. But ya don't wanna be one of them victims we hear about every year. Hunters usually gotta wear 400 square inches or more of orange by regulation, is my understandin'. So that means plenty. An orange hat or ascot ain't gonna cut it. Go big or go home! 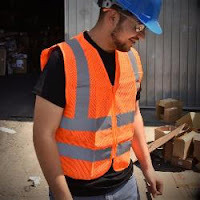 Vanholio just bought hisself a mesh orange safety vest with reflective stripes. Hunters don't get the kind with the reflection for obvious reasons. But I figure it'll double for walkin' roads in dark. 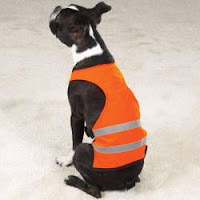 Thinkin' about gettin' a little dog orange safety vest with reflector stripes for Ms. Barkley, too. Sometimes I let her run off the leash. This'll protect her a bit from cars and hunters, plus make it easier to see her if she don't come when called. If van life takes ya to the woods and fields, think about gettin' an orange blaze safety vest for yourself, your people, and your dogs. 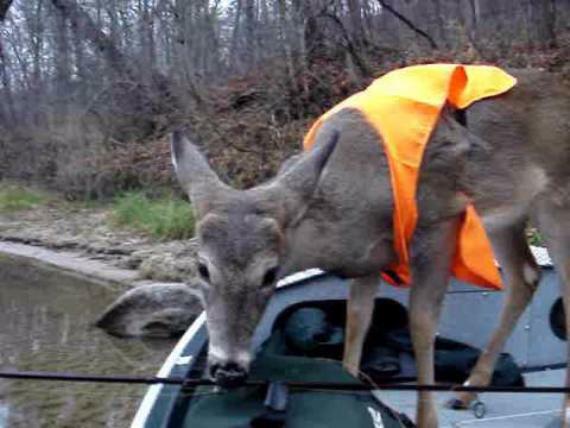 Wisconsin had one of the safest gun deer seasons in history this year. Over half a million hunters, and no direct fatalities. All of the wounded were hunters shooting themselves (mostly) or other hunters (fewer). There was one apparent suicide. I still do what you suggest by sticking to the well-traveled trails or the no-hunt zones and wear a blaze orange hat and gloves. Makes me feel better even if the risk is low. A deer/vehicle collision is probably a higher risk. One ran into the rear bumper of my vehicle this year when I was almost past it. I hit a deer this last year, too. My "bumper" is two pieces a plastic that snap together. Cost? $1,700! Shoulda gotten an old E350 tank of a van. A. It woulda laughed off the deer hit. B. If not, coulda gotten parts from a junkyard. Dammit! You're luck you didn't need to replace a windshield and air bag, too. Got that right! I just clipped him. The desert is a good place to avoid hunters. But then there are folks who just come out to drink beer and shoot a junk. I saw a photo the other day of a guy in camo pants and an orange hoodie. the caption said, "Dude, make up your mind. Do you want to be seen or not?" Is it required to wear this much hunter orange at any other time. Required? No. But maybe it's smart ta have a little somethin' orange. Even outta huntin' season, there are poachers and idiots just out there shootin' guns for the hell of it. Mix Peanut Butter in Your Ramen – No Seriously!